Home James E. Ryan, Attorney General of Illinois v. Telemarketing Associates, Inc, et al. 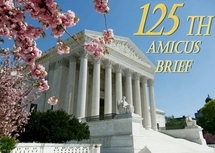 Our firm filed an amicus brief in the U.S. Supreme Court on behalf of the Free Speech Defense and Education Fund, Inc., Conservative Legal Defense and Education Fund, American Target Advertising, Inc., Eberle Communications Group, Inc., Gun Owners Foundation, English First, Lincoln Institute for Research and Education, and Citizens United Foundation in support of respondents Telemarketing Associates, Inc., et al. This brief urges the Court to reject the Illinois Attorney General’s rule that nonprofits which do not make point of solicitation disclosure of the percentage of funds paid to professional fund raisers position are engaged in fraud. The brief explains how the Illinois Attorney General’s litigation strategy of suing the fundraiser but not the nonprofit organization represents a transparent effort to end-run established First Amendment constitutional rights of nonprofit organizations.